WILLEMSTAD - Fundashon Politur Kὸrsou opened its second office in the World Trade Center (WTC). The "tourist police" have been created by the Minister of Justice Nelson Navarro and Minister of Economic Development Stanley Palm. The aim is to improve security in the tourism sector. 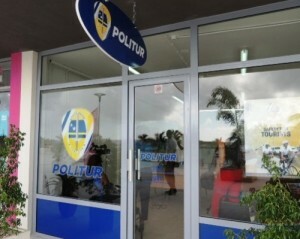 The first Politur opened in December 2013 on the Mambo Beach Boulevard. The advisor to the Minister of Justice, Humphrey Josefa indicated that there are currently sixteen agents working in both locations. The intention is that this number will grow by the end of this year. In total 41 officers will receive extra training in the field of foreign languages ​​and how to help tourists. If everything goes according to plan in the future Politur will also open an office in West Point.